Rating: Short and easy family stroll on a gravel road. 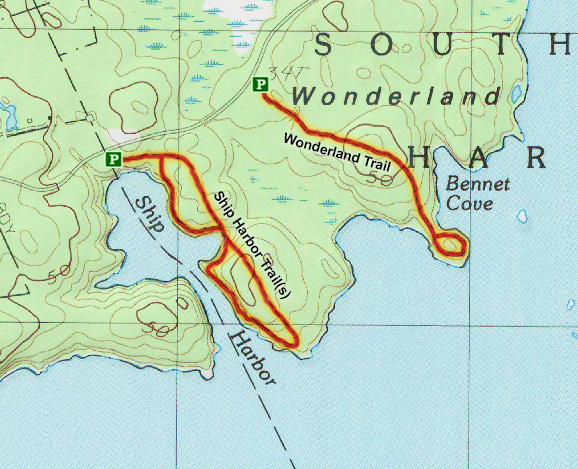 The Wonderland Trailhead is located along Route 102A southeast of Bass Harbor; this is the southern tip of the "quiet side" of Mount Desert Island, west of Somes Sound. The small parking area is clearly marked and is usually full in mid-afternoon in the summer months, but some extra roadside parking spots are available. The trail is very easy to follow as it heads southeast through a lovely pine forest towards the ocean. The Wonderland Trail is actually an old gravel road, so it is amazingly well-groomed and is, for the most part, wheelchair accessible. Along several sections of the trail, ropes surround both sides of the trail to protect the delicate vegetation. Soon enough, the trail reaches the ocean and while the old road loops around towards Bennet Cove to the north, feel free to leave the road and enjoy the rocky shoreline. 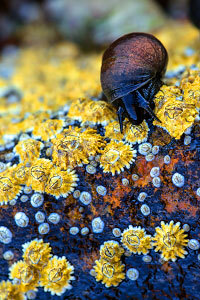 Children and adults of all ages enjoy wandering and relaxing along the shoreline and examining the various tidepools. (A smartphone app like "Tide Chart" is very useful for determining low tide.) Please tread lightly when hunting for life in the tidepools; this is a popular spot and humans can have a negative impact here. Aside from exploring the tide pools, It is also fun to explore the large sheets of crumbling pink granite along the coastline. When you have had your fill, return the way you came. Note: For an optional longer hike, you can continue hiking west around the bay to join up with the nearby Ship Harbor Trail. 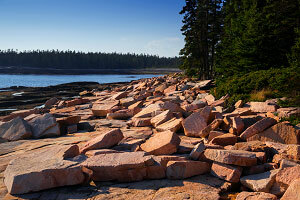 While not as dramatic as the scenery along Acadia's more famous Ocean Path coastline, Wonderland is a fun hike for adults and children alike. There are many great spots along the shore to have lunch or before or after your hike, you can try one of the nearby lobster pounds just outside of the park.